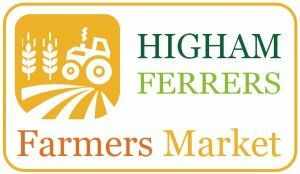 Higham Ferrers Farmers' Market is held between 9am and 1pm on the last Saturday of each month except in December when it is moved to the last available Saturday before Christmas. Our Farmers Market which is accredited to FARMA ASSOCATION and is a very successful monthly market with over 20 stalls each offering something different. A wonderful range of produce available including; pies, organic eggs and vegetables, organic pork and lamb, free range poultry, pork in all its forms, Hot smoked meats, crayfish fishcakes, olives, baklava, pickles, chilli sauces, herbs, fruit, bird food, honey, preserves, artisan bread, plants, cheese and a great varierty of cakes. When you visit the market you are able to purchase fresh produce direct from the stall holders and to ask any questions with regards to the background of the goods. They are always willing to offer you their advice and even some recipes. The FARMA association visits and inspects the market to ensure it complies with a strict set of rules and all the market traders have also been verified as operating within the rules. 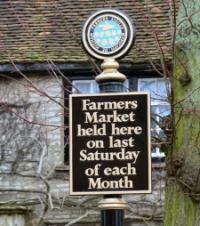 Meet the Farmers Market Traders - Info about our stalls. Farmers Market Rules for Traders.